Drag and the ninja tower to place them to kill the pirate onslaught. Click on the Ninjas in the panel to select the type of tower to build. Hovering over them will tell you what each one does. Note that the poison ninja does extra damage to fliers. You will want plenty of those. Ninjas come out where sets of arrows are pointing and make their way towards the house/ship/boat. Obstacles like rocks and rivers can be used to your advantage or disadvantage. Stop all Pirates, before they reach the main. The continous wave button and the next wave button allow you to speed up the game. Its in your best interest to use all Ninjas available as each of them serves a specific function. If you want to play Ninjas Vs. Pirates Tower Defense 2 games online you have come to the right place! 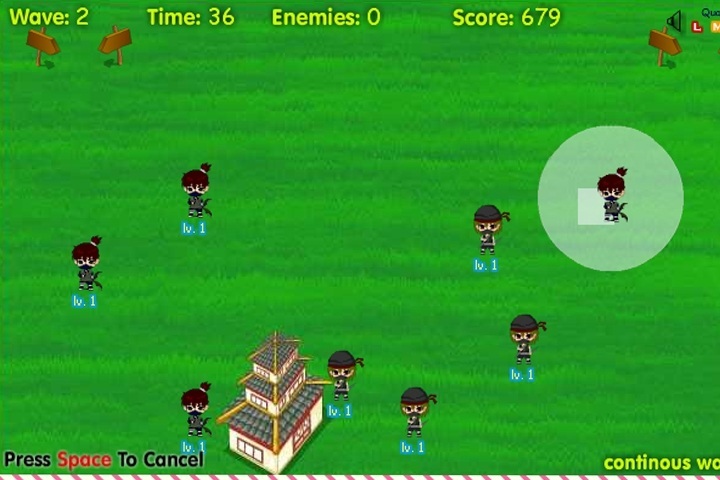 GamesLoon adds new Ninjas Vs. Pirates Tower Defense 2 games every week. This is your game portal where you can find the biggest collection of free Ninjas Vs. Pirates Tower Defense 2 games online. Do not forget to rate our Ninjas Vs. Pirates Tower Defense 2 free online games while playing!